For high production, sturdy unit sets snaps quickly and easily with a single stroke. 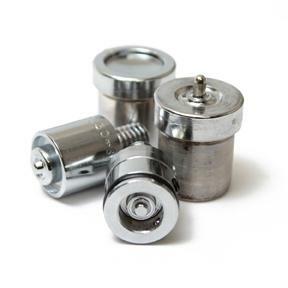 Includes a complete set of dies for Dot Durable and Dura Snap fasteners. This machine must be bolted to the workbench. It is not portable and may be damaged or crack if not solidly mounted. Includes Complete Die Set for Dot-Durable and Dura-Snap fasteners. A lightweight aluminum version of the PM5 machine. Will work with all the same dies for snaps or our full line of self-piercing grommets. Suitable for portable use. Has a deeper throat and longer padded handle. Approximate height is 12 inches. Dies Sold Separately, Below. Will Not work with the Baby-dura-snap (which are a smaller snap). The Dura-snap dies (#4026 below) will work with Dot and Dura-Snap fasteners.